The signs are everywhere. Our oceans are beginning to receive their necessary and long overdue attention. But despite these signs, the average American’s experience with the ocean is limited to a seafood meal or a visit to the beach. For most there is no reason to worry about what is happening beneath the waves far offshore. Throughout my career, I have worked to transform my love of oceans into a concerted effort to protect and expand our understanding of them. That is why we at Absolutely Fish support educational programs and opportunities to connect with animals while learning about the importance of conservation. Although most of you already know we are members of MAC (Marine Aquarium Council), we are also one of the founding members of CRAAG (Coral Reefs and Aquarium Advisory Group). We will have information and support to the following groups set up in the store on Earth Day week – April 17 – 21. We urge all of you to stop by, look at the fish and pick up information (and possibly join) one of these groups. Please do something for the animals you admire as pets and help sustain their future on this earth. Seats at the table will be reserved on a “first-come, first served” basis. Others are welcome to gather around and listen but only those seated at the table will be allowed to ask questions or contribute to the discussion. One moderator and 2-3 guests professionals will be seated at each table. We hope the topics and questions flow wherever they may, just like a live forum. These discussions should be fun, educational, and the first of its kind!! Sign ups can be done in store only. The table will discuss most issues one would be concerned with when deciding on or setting up a marine or freshwater aquarium. 3-5 experienced Absolutely Fish staff members will join this discussion to provide helpful information about products currently on the market and to give tips which will help beginners to be more successful in their new hobby. Don’t waste your hard earned money or time before you have heard this discussion! The table will discuss topics such as fish nutrition, water chemistry/parameters, fish husbandry, and basic and neccessary equipment to maintain a successful marine aquarium. Christopher Brightwell – Chris has been an aquarium hobbyist for more than twenty-five years. He has a degree in Marine Science and has spent the last five years as a product developer for a major aquatics manufacturer working on product research and technical support. Chris’s new book, Marine Chemistry, published by TFH micocosm series, is due out in April of 2006. The table will discuss topics related to setting up and maintaining a naturally planted aquarium. Issues such as lighting, nutrients, CO2 usage and fish compatability will be addressed. This discussion is for beginners as well as advanced hobbyists. Peter J. LaBarbera – Peter is a psychoanalyst who has been cultivating aquarium plants for over thirty years. He personally maintains five planted aquariums and specializes in growing some of the more difficult and demanding species. The table will discuss Reef Aquariums, corals, and other invertebrate needs. Lighting, nutrients, equipment, and undesirable algae will also be touched upon. Gregory Schiemer – Bio profile and aquarium photograph on page 36 of Ultimate Marine Aquariums; Michael S. Paletta. Joseph Yaiullo – Director of Atlantis Marine World Aquarium. 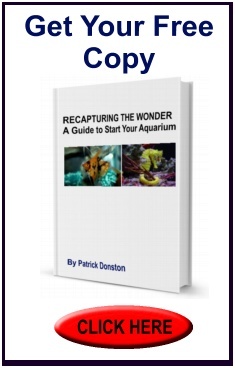 Bio profile and aquarium photograph on page 58, 132, and cover of Ultimate Marine Aquariums; Michael S. Paletta. Watch for extra specials during Earth Day week!